Adjustable Z & L Bracket For ML600 Series. Mounting plates for inward/outward opening doo..
**The P series readers are for use with Switch2 and Net2 systems.The readers are supplied with a .. Single door networkable access control unit. Contents:Connector - 2 way plug ULFasteners - 1..
A Mini Magnet product offering 600 lbs (280 kg) holding force - Magnet size 250(L) x 46 (W) x..
Z & L Mounting Bracket for C3S11 Maglocks. ..
KAC is the global leader in Call Points and has extended its comprehensive MCP indoor security range with a Triple Pole Call Point to complement the double and single pole variants. Offering fast and simple installation, the M8 triple pole Call Point is ideal for use with security controlled locking systems, and provides a flexible solution for integrated systems which require greater functionality in the access control market. The product comprises three change-over outputs which allow the call point to switch three separate circuits. 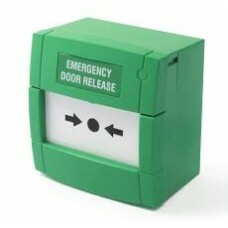 To ensure failsafe unlocking of the exit it is considered best practice to cut both connections, positive and negative, to the magnetic door lock. This utilises 2 separate poles within the call point. The third pole provides additional flexibility to activate a local alarm or sounder or to connect to the building’s security system. KAC’s M8 triple pole call point provides the building owner occupier with the confidence that they can ensure safe evacuation for all persons on the premises in the event of an emergency.